In my earlier blog, “Your house is swiss cheese”, I wrote about how multiple small and large openings in the exterior shell of houses let air move though, crippling the heating system, and how we planned to build an ‘well-sealed’ house with better insulation and a smaller heating and cooling system. No holes would be left unplugged in the outer envelope on our house. However, plenty of holes have been made in the inner structure of the house. In fact, one could almost say that the construction team’s major task for the last two months has been drilling and cutting holes in the structure (and, of course, filling them with various building systems). 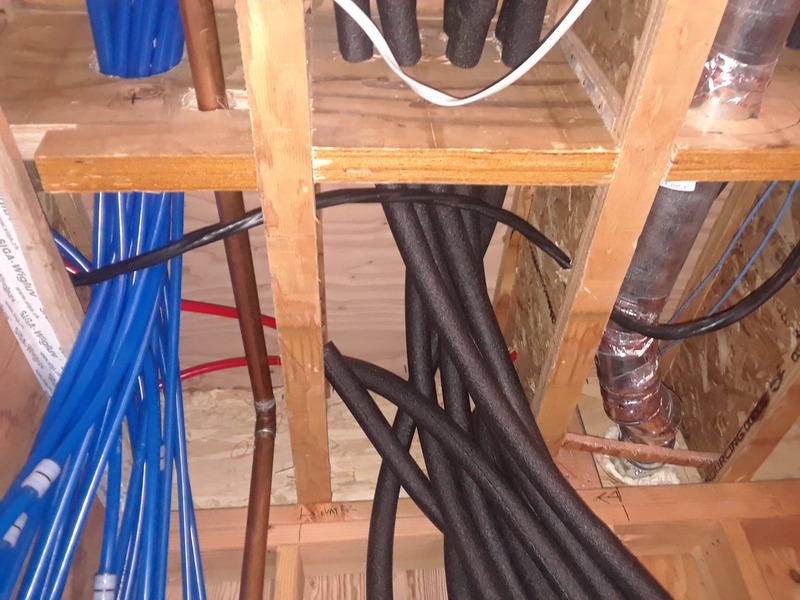 Because our design has no attic, and because we want to keep the crawlspace relative free of services, most of the ducts, water pipes, sewer pipes, sprinkler pipes, and high and low voltage electrical cables are embedded within the wall, floors and ceiling structure. Making a path from one place to another therefore involves drilling, cutting and chopping through our nicely completed structure. There is hardly a stick of framing that doesn’t have holes cut in it. I think we’ve ended up turning ten percent of our structure into sawdust and wood scraps. Most of this is routine, though for some of the more significant structural members we needed to get specific advice from our structural engineer. The rule of thumb for most beams is that holes can be cut in the middle third of the span and the middle third of the depth. We tried to stay with this but there were a few places where we had to violate the rule. One of our more stressful moments on the project was hearing from the HVAC subcontractor that they were expecting someone else (we or the framer) to cut all of the holes for the heating and ventilating ducts. Most of their ducts were in areas where we dropped the ceiling, and our framer had done so by putting thick timber panels around the dropped ceiling areas, which gave a surface for the dry wall to be attached to and provided fire blocking. So much of the hole cutting for ducts was through multiple layers of panels (one on each side of a wall). The balance was through either much thicker structural beams or thinner plywood panels. Even with our short duct runs, several different structural members needed holes cut in them for each duct. All of the other trades cut their own holes, we complained, why don’t you cut your own? They said that on all of their work, generally in the East Bay area, the general contractor or framer cut their holes. Our framer, whose experience is generally in San Francisco, said the opposite, that the subs always cut their own holes. Despite my thirty years of experience, I honestly don’t know what is ‘usual’, and would be happy to hear other’s experience. Our contract with the HVAC subcontractor didn’t address the issue. They estimated it would take them 16 hours of labor at $90.00 per hour to cut the holes. This seemed excessive so I hauled out my brand new DeWalt reciprocating saw (like a more powerful jigsaw) and went to work. Two hours and four holes later, I recognized the HVAC hourly estimate might be low. We got more help from the framer, did another stint or two ourselves, and authorized the HVAC contractor to do the rest. This process seemed to really slow their progress, and the HVAC work extended into four weeks. One of the tasks we took on as a family was installing the low voltage wiring. This includes such things as ethernet cables for computers, co-axial cable for TV’s, security camera wiring, control wires for electric drapes, speaker wire for built-in audio speakers. So, many more holes, small ones, drilled into the structure were required. The low voltage wires can’t share holes or be bundled with high voltage power cables, everything has to be run separately. My thirty year old Craftsman drill, veteran of two previous home remodeling efforts, died on our second day. A serious replacement was called for, and a quick trip to Home Depot resulted in a new family member, a heavy duty Milwaukee brand saw with a ninety degree bend in it, the better for drilling in tight spots. My new best friend, it drills through heavy beams with the elan of Patton driving towards Berlin. Our electrician, plumber and fire protection subcontractors probably added another thousand holes to the structure. One corner, by the electrical panel, got so bad that we had to add a layer of shear plywood, but generally we did all of this without significantly affecting the structure. Did you consider engineered floor trusses designed w spacing for ducts and such? We considered them, and other similar truss materials, briefly but TJI’s were cheaper and easier to deal with, or at least so it seemed at the time. If we were doing it again I would look more seriously at trusses, and at giving a few more inches or a foot in the first floor height. We really did have to cram a lot of mechanical into a small space. But at least by keeping the profile of the house low we saved some of our uphill neighbor’s view.